It’s been too long since I’ve devoted a full post to the Kanilea Pen Company. I purchased my first Kanilea pen, a Mauna Kea, back in March 2017 at the Baltimore Pen Show. In the meantime, I’ve added two more to my collection: a Nui Nalu and a Hanauma Bay (from their “Elements” and “Locations” collections, respectively). In my earlier post, I went over the history of the brand, and particularly how Hugh and Karol Scher launched Kanilea based on their family’s travels to and love of Hawaii. I’ve regularly remarked on how I consider Kanilea to be one of the most unique well-conceptualized, and well-implemented “small batch” pen brands. 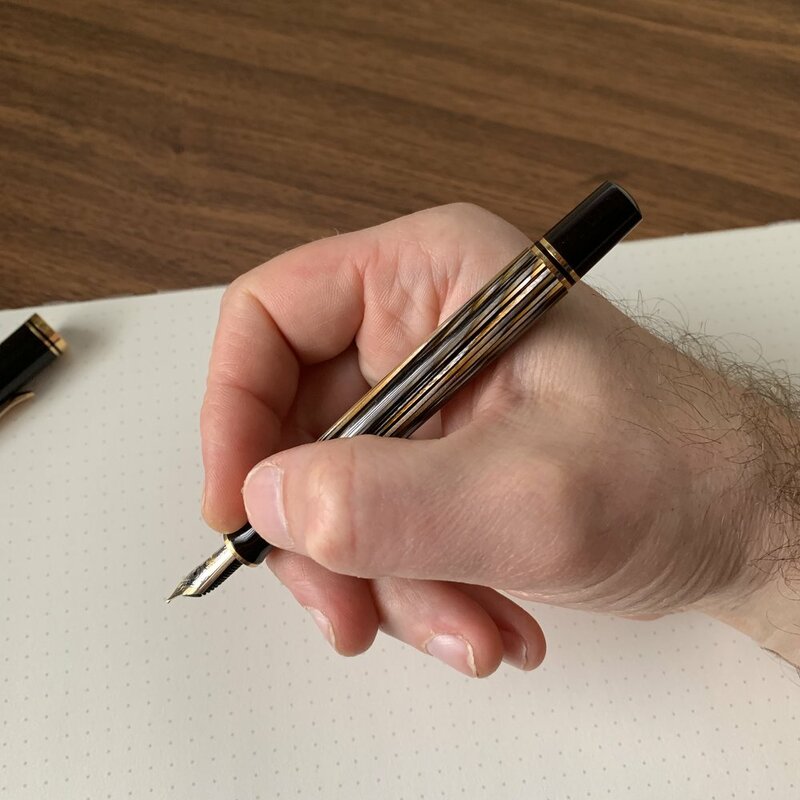 (By “small batch,” I mean pens that aren’t made-to-order custom pens in a material/design chosen by the customer, but rather come from a standard product line, made in extremely small quantities and, in the case of Kanilea, entirely by hand.) Regardless of whether or not you find the aesthetic of the pens appealing, you have to appreciate what Hugh and Karol have done with the brand in such a short period of time. The Nui Nalu (“Big Waves”) fountain pen was inspired by the waves on the North Shore of O’ahu. I chose this particular pen due to how the white swirls were both evenly distributed through the material AND formed a continuous “wave” pattern. It’s not as obvious in my pen, since the darker swirls and “whitecaps” are more prominent, but sections of the acrylic are slightly translucent, allowing you to see the converter or, alternatively, the ink should you choose to eyedropper the pen. I also selected a different shape from my Mauna Kea, opting for the Classic rather than the Classic Flush, so the cap on this pen is slightly oversized. The Hanauma Bay fountain pen, from the “Locations” collection, was inspired by a photograph of a sunset over Haunauma Bay, O’ahu. The pen is definitely one of the wilder pieces in my collection, with the acrylic featuring swirls of green, gold, white, turquoise, blue and orange, and the orange and blue showing a good degree of translucency. Most notably, my Hanauma Bay is a “Classic V” shape with a sterling silver clip, and this design posts, which distinguishes it from most of the other Kanilea models. The pen is a bit long posted, but it’s also quite light due to the acrylic construction and cartridge-converter system, so I can easily post it when I don’t have a convenient place to set the cap down. Premium design and construction warrants a premium price. Kanilea Fountain pens start at $395 for a pen with a steel nib, with gold nibs $125 extra, and rose gold nibs $135. The acrylics are custom made for Kanilea, and the pens are all hand-turned. Trim (clips and medallions) are sterling silver, and nibs are all tuned by Hugh prior to shipping. Finally, most people ignore (or throw out) the packaging from their pens after purchasing, but you’ll want to hang onto your wooden Kanilea box, which makes a great keepsake or pencil box for your desk. I’ve found ways to use all three of them! Kanilea Clips and Medallions are made with Sterling Silver, lending the pens a very classy, high-quality look. All Kanilea pens come with a postcard featuring the photograph that inspired your pen’s design. In my 2018 recap, I wrote that I would be limiting the number of pens I bring into my collection going forward. One of those slots will almost certainly be held open for a Kanilea Pen, as they always seem to be releasing something new and interesting around the time of the D.C. Pen Show, where I’ve purchased both my Nui Nalu and my Hanauma Bay fountain pens. These are among my favorite fountain pens in my collection, due to both the overall aesthetic as well as the care and craftsmanship that go into the pens themselves, and I look forward to adding more in the future. Kanilea doesn’t sell through retailers, only directly, so you are limited to purchasing one of their pens through the Kanilea Pen Company website or at a pen show. This year, Kanilea will be attending the Baltimore, Chicago, Washington, D.C., and San Francisco Pen Shows. If you can get to one of these shows, I personally recommend visiting the Kanilea table and seeing the pens in person before you make a decision. Don’t get me wrong, all of their pens are beautiful, but there is so much variation in the materials they use that one pen might speak to you more than others. Disclaimer: I purchased the pens featured in this review with my own funds, for my own personal collection. I was not compensated in any way for this review, and all opinions expressed are my own. I believe someone wrote into the Pen Addict Podcast a couple of months ago asking whether there was one brand you couldn’t quit, even though you may have had some issues over the years. For me, that brand is Kaweco, and the Sport models in particular. While Kaweco has frustrated me in the past with their inconsistent quality control on nibs, I love the form factor of the Sport lineup, making it one of the pocket pens I reach for most often. Nib quality has improved recently, though I still have the most luck with mediums and fines. This post will take a look at a few new additions to the Kaweco lineup over the past year that have managed to make their way into my collection. From left, the Kaweco Art Sport in Dark Blue, the Kaweco Skyline Sport in “Fox,” and the Kaweco AL Sport in Red. In late 2018, Kaweco announced two new colors for their basic lineup, the Classic/Skyline Sport: Navy Blue and “Fox”. Since I had recently purchased a Dark Blue Art Sport (see below), I passed on the Navy Blue, plus it had gold trim and I preferred the Art Sport’s chrome. The Fox, however, spoke to me immediately, with its muted, almost terra-cotta tone coupled with the Skyline series’ chrome trim. Other than the new color, there’s not much new to say about this pen. The medium nib is a good enough writer, and the standard Kaweco Sport continues to be one of those pens that is easy to recommend at the lower end of the pricing spectrum, especially for beginners. AL Sport: Finally, a Red One! This pen caught me completely by surprise at the 2018 Atlanta Pen Show, where Lisa Vanness had quite a stock at her table. I believe this ruby red color was a North American exclusive for a limited period of time, and for a while Vanness was the only retailer who stocked this particular version. I initially reviewed the AL Sport back in the early days of this blog, and everything I said about that pen still holds true: it’s a pocket-sized workhorse that’s quite durable, and will look even better over time as the anodized finish wears off and takes on that “stonewashed” look. I first had a chance to take a look at the current Art Sport lineup when I was working the Vanness Pens table at the 2018 D.C. Pen Show. Art Sport: The Best Version of What The Sport Can Be? When it comes to Kaweco, I accept that I’m going to have to trade reliability for a general lack of nib variety. For the best writing experience, the simple medium works best for me, and it’s what I purchase in all of my Kaweco pens. As I mentioned, I purchased the red AL Sport from Vanness Pens, who still has it in stock for $90. I acquired the Skyline Sport in Fox and the Art Sport in Dark Blue from Pen Chalet, where they’re currently priced at $25 and $130, respectively (before any applicable coupon code). When this series was first released, Kaweco priced the Art Sport models at $175, which I consider way too steep. The turned acrylic and limited edition colors are nice, but this is still a small pen with a steel nib, and a standard $125-135 price point seems appropriate given the “small batch” nature of the production. If Kaweco kept the current pricing standard, they’d gain a lot more traction with the Art Sport, in my opinion. Disclaimer: This post contains links to paid sponsors and affiliates. 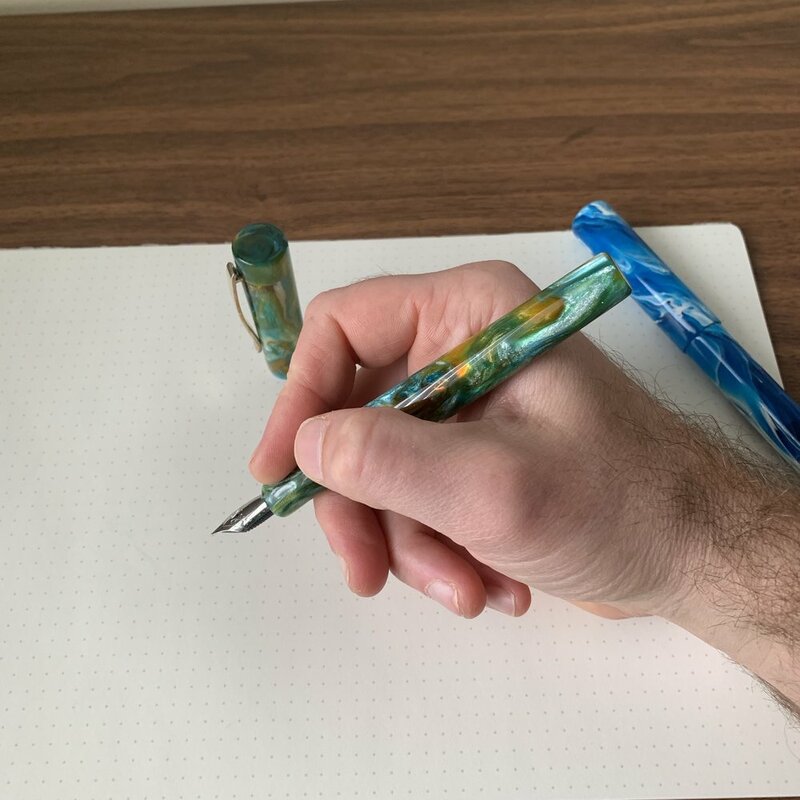 I purchased the AL Sport pictured in this review with my own funds from Vanness Pens, and acquired the Fox Skyline Sport and the Art Sport from Pen Chalet using store credit generated through their affiliate program. All opinions expressed herein are my own. A comparison shot with another pocket pen that I recently reviewed: the Sailor Sapporo Mini.